Home › Bibliography › Ken Gonzales-Day: Profiled at the Koppelman Gallery. Ken Gonzales-Day: Profiled at the Koppelman Gallery. MEDFORD, MA – Ken Gonzales-Day’s “Profiled” exhibition at Tufts University’s Koppelman Gallery is a show you don’t just drop into. Gonzales-Day, like many art photographers, has a talent for capturing his subjects in arresting moments. He takes great care with lighting, positioning, equipment and technique. And yet, his talent, when all is explained, is still both arresting and deeply baffling. The mystery of these portraits is that, as lively as they are, the subjects “profiled” are definitely not and have never been alive. In this project, Los Angeles based artist and art historian, Ken Gonzales-Day has rifled through the storerooms of such well-established museums as the J. Paul Getty in Los Angeles and the Field Museum of Natural History in Chicago, among others, both foreign and domestic, to haul out and dust off mostly busts but occasional full length figures of both ideal Western types and less ideal sculptures pretending to represent “anthropologically correct” non-Western races. 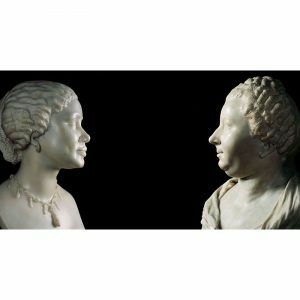 Both Western ideals and race theories have been so demoted and/or debunked by modern and post-modern critiques that nowadays, these busts, if not stored or de-accessioned, are mostly to be seen only in old textbooks or in the narrow corridors leading to museum cafeterias and restrooms. Where, for example, is the drama now in exotic “types” purporting to represent a “Mongolian” or an “Indian”? Even historically European ideals of excellence and beauty have taken heavy hits as a growing sophistication has both enriched and complicated our view of humanity. Still, Ken Gonzales-Day’s photographs pump new life into supposedly by-gone world-views by taking their representatives in marble, bronze and clay out of gloomy storerooms, back-corridor hide-a-ways and placing them both center stage and in dialogue. One example that fizzed with interaction for me was a wall-length confrontation/dialogue between, on the one side, “two ideal types”: a full-length marble Venus joined by an equally glowing portrait bust of an upper-class woman; and, at the other side, a “typical” Chinese” woman twinned with a “typical” Eskimo women, each in rather weather-worn clay. And, more. Subtle lighting, delicate tints, deft positioning all lift these sculptures into such real spaces and seemingly “real” bodies that the viewer expects them at any moment to turn from their age-old dialogue to quiz him or her. The same wizardry animates a smaller-scale photograph of two black marble busts, one of a “renaissance” or classically Western type; the other, an African man with tighter curls and fuller features. The planes of their faces leap with light, the tilt of their profiles, across an electric field, seems to speak of a complex engagement. And the viewer, drawn to interpret between them, nervously wonders if, at any moment, he himself will be the object of two probing, quizzical gazes. Who knew that museum storerooms, opened up, would yield such lively, provocative spaces? And now that Ken Gonzales-Day has opened them up, will they ever be fully and finally closed again?